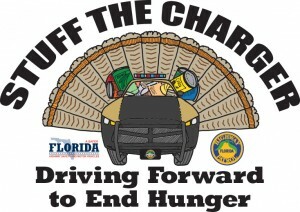 TALLAHASSEE, Fla. – This week Florida Department of Highway Safety and Motor Vehicles announced the start of its annual “Stuff the Charger” Thanksgiving food drive. Through November 7, 2015, the Department will be collecting non-perishable food donations for Florida’s families in partnership with food banks across the state. Throughout the 2014 food drive, the department collected more than three tons of food for families throughout Florida. With the help of Floridians across the state, the department has set a goal to double that total this year.